Regular readers know my position on the Twinkiefication of American palates and how many producers are catering to it. In true cranky old man fashion, I've lamented everything from the schmaltzy branding of these products to the heavy-handed manipulation required to turn grape juice into liquid adult candy. (Kids these days!) So, no surprise that I was prepared to dislike this pair of samples that arrived recently. 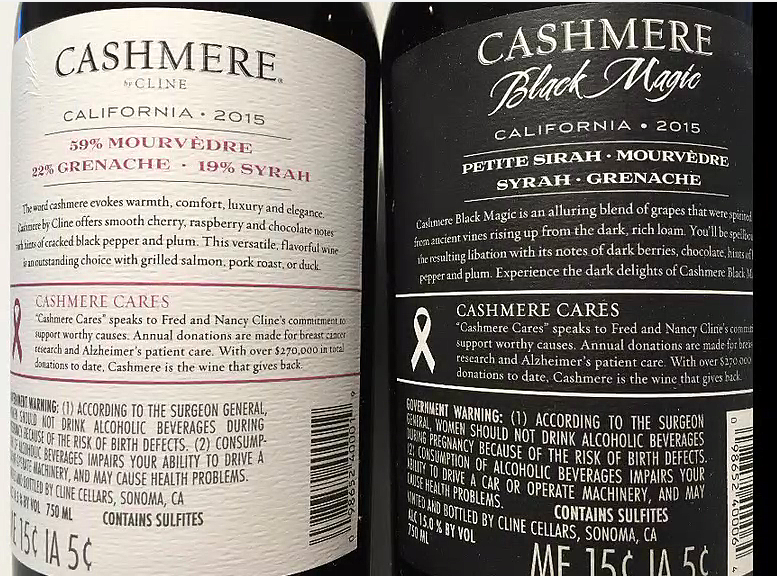 After all, one is named Cashmere and the other Cashmere Black Magic. The regular bottling is labeled "exquisite", the other "alluring" and "dark" (Halloween gimmickry? ), reaffirming the suggestion that these wines are among the aforementioned high sugar, high alcohol ordnance. But what does closer examination reveal? Bottom line: I'll be making it a point to seek out these - and other Cline wines - soon. 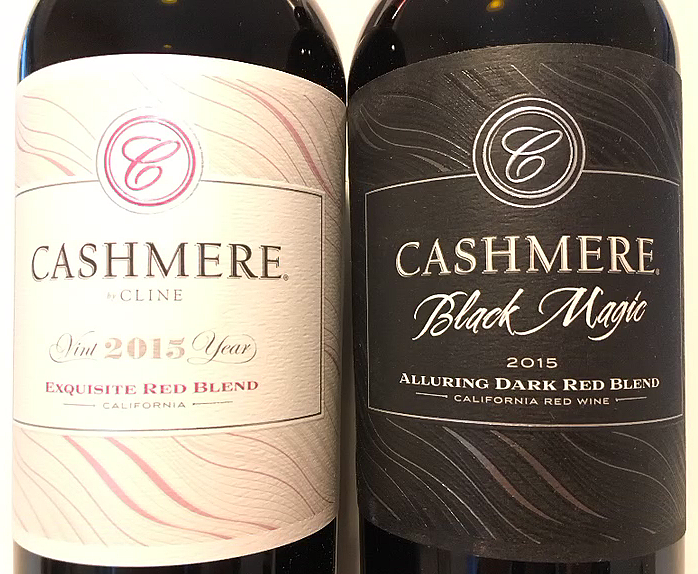 Color and density are lighter (much, in fact) than anticipated, showing a medium garnet in the glass - lighter actually than most pinots. Nose is exciting and fast-moving, leading to a mouth full of lovely fruit kaleidoscope characterized by strong spices. Tannins are well integrated into the fine texture. Very accessible and enjoyable. Besides being an abject lesson in not judging a book by its cover, I love this wine and the way it's presented because it is introducing a whole category of drinkers to what is really a traditional Rhone blend. Sneaky and genius. Bravo. Here again expectations have been defied. The syrupy viscosity anticipated in a wine with a name like Black Magic just isn’t there. In its place is an attractive, deep ruby color that moves in the glass like and unadulterated, long-legged cabernet. The nose is active with bright fruit outlined by subtle green vegetable characteristics and the same spicy allure as the regular Cashmere bottling. The palate is what really sets this bottle apart from its sibling thanks to the unapologetic brawn of petite sirah, which shows off its heft and texture with honesty and true varietal character. While definitely a big wine with lots to offer those with big wine appetites, it is not the gloppy monster I’ve come to expect from dark red blends. Well made and composed.